The retro feel of this book cover caught my eye, and the description sounded like a good story with some substance to it. It is set in 1959, just when the Civil Rights movement was simmering. The book jumps back and forth between two families, one black and one white, each with their own unique problems. Bobby is the main character. In addition to his parents having marital problems, he and his brother Ricky can’t stand each other. Bobby and his brother and mother are on a three-day road trip, driving their grandmother back to Florida. Along the way, they stop at Civil War battlefields because Ricky is obsessed with history, especially the Civil War. Ricky and Bobby are always arguing and fighting with each other. In contrast, the black family is tight-knit and loving. Their struggles come from outside the family – racism and prejudice when they are out in public. Their 10-year-old son Jacob goes missing and they are hysterical with fear that Jacob has been kidnapped or killed. The story had such great promise, but just seemed to fizzle out. I thought at some point the two families would meet, that Bobby and Jacob would be talking to each other, that there would be some sort of conclusion that we all struggle with the same things regardless of our skin color. But the families actually never interacted with each other, making the story seem disjointed. Also, there was just too much bickering and fighting and angry words in Bobby’s car. Too much negativity in a story can kill it, and I think it ruined this story. This is a book I should have passed on. This is a masterful book in which the author describes his life as a young boy growing up in Oceanside, California with his parents. His father was a man with a fiery temper and a reputation of being a gangster, but also with an undying loyalty to his family and his heritage. His mother was beautiful and loving, and always teaching her children about Jesus and the saints. His father bought a ranch when Victor was very young, and that is where the book takes place. Victor thought going to school would be fun when he started kindergarten. Instead, the first thing he learned in school was that he was considered inferior and stupid because of his Mexican ancestry. Both the teacher and the other students made life miserable for him. He was teased, bullied, slapped around and beaten up, and no one seemed to care. To make matters worse, he was having a terrible time learning the alphabet and simple words. Things were just as bad when he got to first grade, second grade, and third grade. He was forced to endure the humiliation of repeating third grade because he still was unable to read. His parents tried several different schools, but it was the same wherever he went. No reading, but a lot of bullying. It was not until Victor was an adult with children of his own that he was diagnosed with the most severe form of dyslexia. It was hard to read of such blatant racism and prejudice. I wanted to ask what on earth was wrong with those teachers and principals, that they tolerated the abuse Victor was suffering. No child should ever have to go through what Victor went through. There was a fair amount of anger and swearing in this book, but it would have been difficult to give an accurate portrayal of Victor’s family life without the language. There were also tender moments, when Victor’s father shared some very profound thoughts about forgiveness. Although it was a rough story with raw emotion, it was a camera into the soul of a person who has battled the devil of prejudice and racism, and won. If you have read any of this author’s books, you are familiar with the Logans, an African-American family living in Mississippi in the early 1900s. This book is a prequel to Roll Of Thunder Hear My Cry, the author’s most well-known novel. All her stories, though fictional, are based on events that actually happened to her father’s family. In “The Well”, it is 1910 and a severe drought has hit part of Mississippi. As wells dry up, everyone becomes desperate for water. Eventually, the Logans have the only well that still has an adequate supply of water. Neighbors – both black and white – come by with barrels, and the Logans share with all. Unfortunately, young Charlie Simms is determined to harass and belittle any black person who doesn’t submit meekly to him. Ten-year-old David Logan tries to appease Charlie, but his older brother Hammer gets in a fight with Charlie. The situation quickly escalates to the point where someone could be lynched. For anyone born after the days when it was not uncommon to hear of lynchings of black people, this book is a bird’s-eye view of the degradation and abuse of African-American citizens. Appropriate for ages ten and up. In the mid-1940s, Morgan Hill is a tiny, quiet town where nothing much every happens. Then one day, a black family moves in. Some neighbors extend a welcoming hand and heart, while others plot ways of making the family move out. A unique friendship develops between Fran Gable, a widowed mother of two, and Addy Turner. When a tragedy strikes and Addy is dying, Fran promises she will raise young Milo. Her children, Jane and John, love Milo and consider him a little brother. But money is tight, and prejudice is running high. Fran begins to wonder if maybe it would be less traumatic to Milo if she allowed him to be adopted by a black family. This is an interesting read that tackles the subjects of true friendship, bi-racial adoption, and conflicted feelings within the family. How important is it to look like the rest of your family? Does it even matter? This thoughtful little book can easily be read in a couple evenings. The story is told in one long monologue. A young Pakistani man, Changez, strikes up a conversation with a traveling American man at a cafe in Lahore. It’s actually a one-way conversation, as it appears that the American barely speaks a word during the evening. Changez is tormented in his mind, and needs to pour out his thoughts to someone. He ends up telling his entire life story to the stranger in the cafe. Although born in Pakistan, Changez manages to make his dreams come true by being admitted to Princeton University in the U.S., and later being hired by a prestigious company. He absolutely loves life in New York City, and falls in love with an American woman, Erica. He considers himself almost American. Then comes the terrorist attack on the twin towers. Suddenly he is looked upon with suspicion and distrust because of his nationality. The book shows well the inner turmoil of a person who experiences life in the United States, and then has to return to his homeland. Changez has tasted the goodness of the American culture, then has to deal with the bitter hatred coming from the same group of people. The irony is, of course, that he begins to resent and hate them too. Prejudice and racism turn into a vicious circle that just goes on and on, and always ends as a sad story. 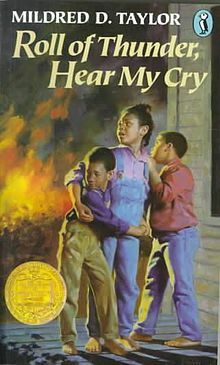 This classic book is about a black family living in Mississippi during the years of the Great Depression. There’s Big Ma (the grandmother), David Paul and Mary (the parents) and their children – Stacey (12), Cassie (9), Christopher-John (7), and Little Man (6). Not far into the story, Uncle Hammer joins them, as well as an unemployed man named Mr. Morrison The Logan family owns a 200-acre farm, which was purchased after the Civil War from a northern carpetbagger. The white family that used to own the land wants it back, and will go to great lengths to get what they want. The story is told by Cassie, the only daughter of David and Mary. Through her eyes you see the tightness of the family , as well as the harassment and prejudice that they experience from the white community. However, there are several whites who are portrayed in a positive light – Jeremy Simms, a classmate that does not share his family’s racial prejudices, and Mr. Jamison, a lawyer who supports the boycott against the local grocery store. I greatly enjoyed reading this book. The conversations between Cassie and her three brothers were very authentic, and sounded like any other siblings’ squabbles. But my favorite part of the book had to be when her brother Stacey came up with a plan to get back at the bus driver who was always humiliating them. I also found Jeremy’s relationship with the Logan kids interesting. He was trying so hard to be their friend, but there just wasn’t any way to have a bi-racial friendship work for them.